A common point of confusion is the overloading of the terms service and role for both types and instances; Cloudera Manager and this section sometimes uses the same term for type and instance. For example, the Cloudera Manager Admin Console Home page and Clusters > ClusterName menu lists service instances. This is similar to the practice in programming languages where for example the term "string" may indicate either a type (java.lang.String) or an instance of that type ("hi there"). When it's necessary to distinguish between types and instances, the word "type" is appended to indicate a type and the word "instance" is appended to explicitly indicate an instance. 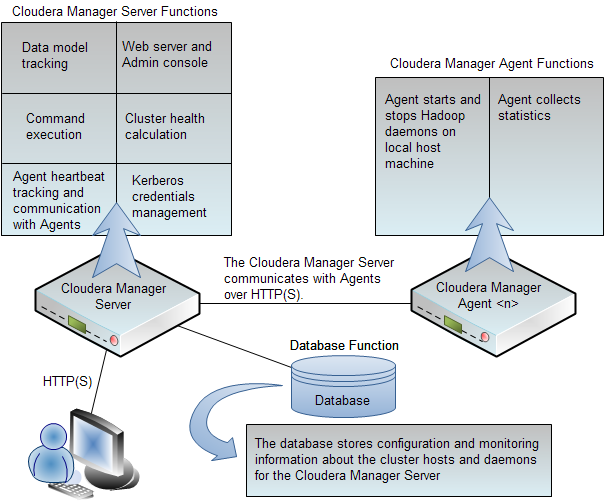 In Cloudera Manager, a physical or virtual machine that runs role instances. Linux runs a System V init script in /etc/init.d/ in as predictable an environment as possible, removing most environment variables and setting the current working directory to /. Runtime state is what processes are running where, and what commands (for example, rebalance HDFS or execute a Backup/Disaster Recovery schedule or rolling restart or stop) are currently being executed. 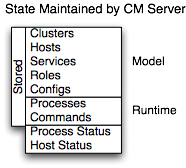 The runtime state includes the exact configuration files needed to run a process. When you select Start in the Cloudera Manager Admin Console, the server gathers up all the configuration for the relevant services and roles, validates it, generates the configuration files, and stores them in the database. Parcel handling automatically downloads, distributes, and activates the correct parcel for the operating system running on each host in the cluster. Mixed operating system type and version clusters are supported, however using the same version of the same operating system on all cluster hosts is strongly recommended. When using YARN with Impala, Cloudera recommends using the static partitioning technique (through a static service pool) rather than the combination of YARN and Llama. YARN is a central, synchronous scheduler and thus introduces higher latency and variance which is better suited for batch processing than for interactive workloads like Impala (especially with higher concurrency). Currently, YARN allocates memory throughout the query, making it hard to reason about out-of-memory and timeout conditions. 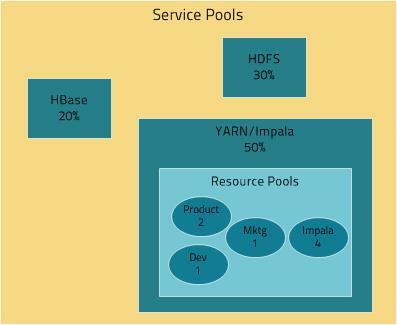 (CDH 5) YARN and Impala Independent RM - YARN manages the virtual cores, memory, running applications, and scheduling policy for each pool; Impala manages memory for pools running queries and limits the number of running and queued queries in each pool. (CDH 5 and CDH 4) Impala Independent RM - Impala manages memory for pools running queries and limits the number of running and queued queries in each pool. OS Filesystem-level - Encryption can be applied at the Linux operating system file system level to cover all files in a volume. An example of this approach is Cloudera Navigator Encrypt (formerly Gazzang zNcrypt) which is available for Cloudera customers licensed for Cloudera Navigator. Navigator Encrypt operates at the Linux volume level, so it can encrypt cluster data inside and outside HDFS, such as temp/spill files, configuration files and metadata databases (to be used only for data related to a CDH cluster). Navigator Encrypt must be used with Cloudera Navigator Key Trustee Server (formerly Gazzang zTrustee). HDFS-level - Encryption applied by the HDFS client software. HDFS Data At Rest Encryption operates at the HDFS folder level, allowing you to encrypt some folders and leave others unencrypted. Cannot encrypt any data outside HDFS. To ensure reliable key storage (so that data is not lost), Cloudera Navigator Key Trustee Server should be used, while the default Java keystore can be used for test purposes. See Integrating HDFS Encryption with Navigator Key Trustee Server for more information. Network-level - Encryption can be applied to encrypt data just before it gets sent across a network and to decrypt it just after receipt. In Hadoop this means coverage for data sent from client user interfaces as well as service-to-service communication like remote procedure calls (RPCs). This protection uses industry-standard protocols such as TLS/SSL.